So, as readers of my blog know, one alternative to Windows is Linux. (Formally GNU/Linux) Another alternative I haven’t talked much about is BSD, another Unix derivative. Both of these are great operating systems, but they aren’t Windows. For the most part, this doesn’t matter. If I can do the same stuff on Linux, why not use an operating system unencumbered by patents and other nasty things. However, some people need to use Windows. They need the programs or they just don’t want to learn a new OS. On Linux (and possibly BSD), an imperfect solution is to use Wine. Wine is not an emulator (that’s what Wine stands for, incidentally) but rather implements DLLs in order to run Windows programs. They get closer and closer every day, but it’s imperfect and will probably continue to be for quite some time. For gamers, there’s Cedega, but that costs money – a monthly fee to be exact. Now there is a new alternative called ReactOS. ReactOS is a project whose goal is to create a clone of Windows which is binary-compatible with Windows NT and Windows XP. The projet is not yet in a completely workable state – ie. you couldn’t drop it in and forget all about Windows. Part of the delay has to do with the fact that they have been accused of pirating MS code and putting it into ReactOS via a copy of the Windows NY sourcecode that found itself on the internet a couple of years ago. I guess MS feels that it would be impossible for someone to create as awesome an OS as theirs without cheating. (Nevermind this is how MS rose to prominence vis-a-vie DOS) However, after having gone through 15% of their code, they can say that what they have gone through so far is MS-Code free. Since I don’t have a test system laying around that I can just plop operating systems onto, I did the sensible thing, I downloaded the VMWare Image. VMWare seems to be the new liveCD, as every project seems to be releasing one nowadays since VMWare made their Player software free. At first I was dissapointed in the lack of software available. I know they are trying to copy windows, but they didn’t have to copy Microsoft’s lack of programs. 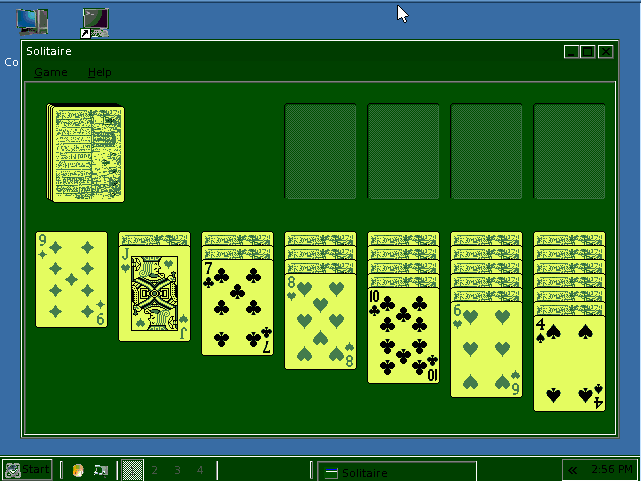 But then my fears were placated when I saw solitaire in the menu. Afterall, for the first few years after we had a computer, my mom referred to it as her solitaire machine. Other than type up her resume it was all she did with it until I went to college, when she became Internet-savy. Turns out, they still have some bugs to fix, however, as the following screenshot shows, the colours went crazy when I opened solitaire and remained that way until I rebooted the virtual machine. The interface seems to be a mix of Windows ME and Windows XP. Of course, the programmers also seemed to throw in some of what they’ve learned from the Linux world, which is not in any current Windows computer – the use of virtual desktops, for example. 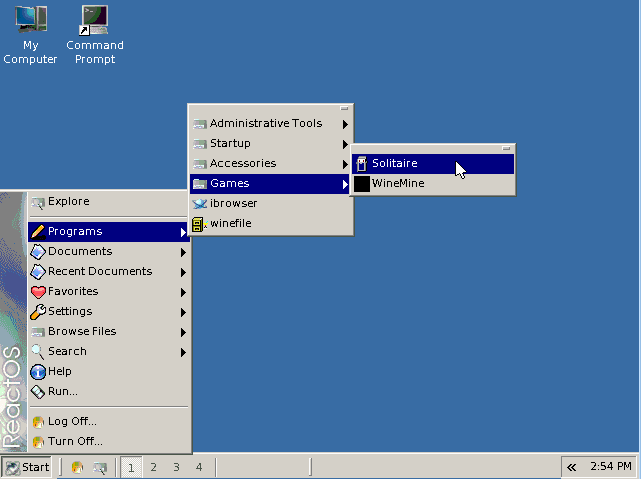 Although ReactOS utilizes some of the Wine Project within their OS, they insist that by completely implementing a Windows environment that programs will run better in their OS than in Linux via Wine. That remains to be seen, but this project is certainly worth keeping an eye on and I have added it to the FOSS links here on my blog. I think that any alternatives which help people research, learn, have access to non-restricted OSes if they are poor, and other things I can’t think of now, is a good thing. If they can truly get ReactOS off the ground, they will have the advantage that any product already made for Windows will run on ReactOS, unlike with Linux. However, unlike Linux this means that ReactOS will be a free operating system dependent upon non-free programs. So it has one mark in its favor and one against it, leaving a zero sum. I will reserve judgement until the project matures a bit. Certainly anyone who worked with Linux in the early days would have assumed that it would never reach the levels it currently has. When I did a search on Technorati, an overwhelming amount of blogs talking about ReactOS were in russian. This goes to show that it may help those with less money get on the technology train.